This Diwali with Mi sale is here for three days. Buy the newly released products for just One Rupee. Two days of sale period remaining. It has been hardly one day since the sale began. And the 10 lucky ones have already got their brand new POCO F1 mobile for just a rupee in the form of their Diwali gift. Some 35 other lucky customers have also won this jackpot opportunity and brought home their Mi Home Security Camera 360. Xiaomi has always been in the news for its flash sales. But this offer is something you would not like to miss. It is more like a promotional sale of POCO F1, though it’s going to make your Diwali more special. And when you have a phone worth Re 20,999 at just Re 1 which is almost free. But you need not worry; the sale does not end here. Here is the list below check this out to know what you can grab in the next remaining days. But remember there are only two days left so hurry up! Xiaomi is giving a sell out for 30 units of Mi Compact Bluetooth Speaker 2 and 10 units of Redmi Note 5 Pro Gold 4GB+64GB both @Re 1 each. The very same day there are 20 units of POCO F1 + Security Camera available @ Re 2699 each and 20 units of Mi Pocket Speaker 2 + Mi Car Charger @ Re 599 each. On the last day of the deal, they have a more fantastic cut on 5 units of Mi LED TV 4A PRO 123.2 cm (49). That’s not all, you also get 10 units of Mi A2 both at Re 1 each. And the last day last hour offers to you 20 units of Mi Casual Backpack + Mi Earphones Basic @ Re 349 each. And along with this, there are 20 units of Mi Air Purifier 2S + Filter: Re 2499 each. 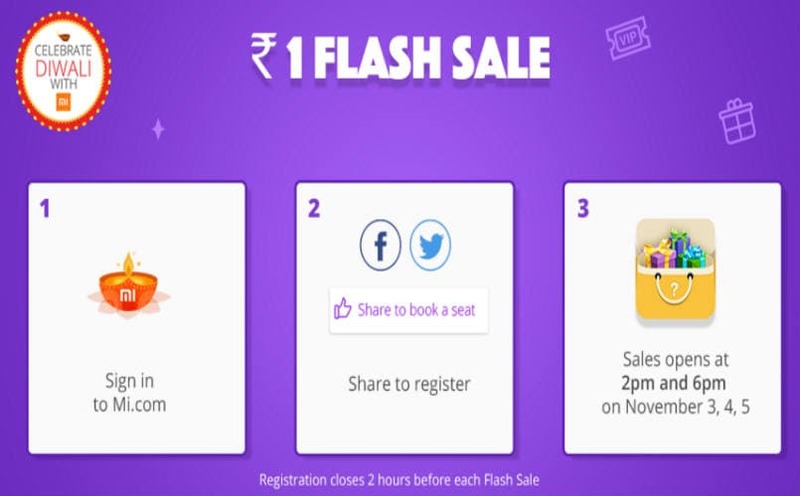 Last but not least, is the bumper offer where Xiaomi is giving out an additional flash sale at 6 PM. Here you get a combo of two Xiaomi products at a special price. This Diwali with Mi sale has got more discounts like, you will get Redmi 6A @ Re 5,999 which is a drop of Re 1000 from its regular price. Mi A2 @ Re 14,999 with a drop of Re 2,000. These three days sale is going to be one of the most significant deals of this DIWALI you could avail. Xiaomi is letting around 1 lac of its assets out just to put on a smile on your faces. So, go ahead grab the best deal if Diwali with Mi sale. Note: Do crosscheck the official details regarding the Diwali with Mi sale. Sales, discounts, and prices could vary.